A regulatory filing shows Aetna made more than $7 million in donations to conservative political groups. NEW YORK (CNNMoney) -- Insurance giant Aetna inadvertently disclosed more than $7 million in donations to conservative political groups in a regulatory filing made earlier this year, according to a Washington-based advocacy group. Documents obtained and distributed by Citizens for Responsibility and Ethics in Washington show that Aetna made a $3 million donation to the American Action Network and a $4.05 million donation to the U.S. Chamber of Commerce in 2011. Aetna made the disclosure in a year-end regulatory filing with the National Association of Insurance Commissioners, an organization that sets insurance industry standards and provides regulatory support. A subsequent amended filing, made in June, does not list the donations. 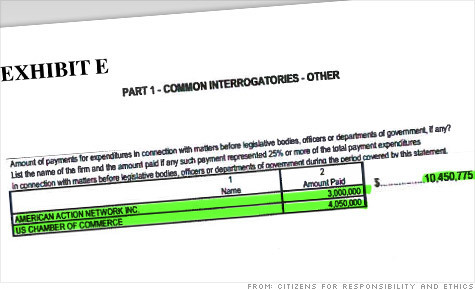 The authenticity of the documents was confirmed to CNNMoney by the NAIC. Advocates of campaign finance reform say the disclosures, first reported by trade publication SNL Financial, are extremely unusual, and represent the first known major donations from a publicly traded company to political organizations that are not required to reveal the source of their funding. American Action Network is organized as a 501(c)(4) group, and has deep roots in conservative circles. Former Sen. Norm Coleman, a Republican from Minnesota, is on the board of directors, as is former Rep. Vin Weber, a member of Mitt Romney's economic team. The Chamber of Commerce is Washington's most powerful business lobby. While the organization does not endorse candidates for president, it is expected to spend tens of millions of dollars this election cycle to influence other races. The regulatory filing puts the insurance company in the unusual position of having voluntarily disclosed donations to groups that are attractive for the very reason that they do not reveal the source of their donations. "I think Aetna screwed up. I don't think they needed to disclose this," said Melanie Sloan, the executive director of CREW, an advocacy group that opposes corporate political spending. Aetna (AET, Fortune 500) provided CNNMoney with a letter from CEO Mark Bertolini that acknowledged donations to the groups, but claimed the funds were meant for educational purposes. "No funds were provided to these organizations for lobbying purposes; however, we have provided funds to these organizations for educational activities," Bertolini said. 0:00 /2:18How many GOP ads do Iowans see? By law, American Action Network, a tax exempt group, must limit itself to "charitable, educational, or recreational purposes." But in practice, the phrase "educational activities" is often used as a euphemism to describe so-called issue ads. Issue ads can indirectly express support for or opposition to a candidate but may not explicitly urge the viewer to vote for or against that candidate. Critics of such advertising call them thinly disguised campaign commercials. "Educational activity is a term of art that has been applied to electioneering communication," said Kathy Kiely, a managing director at the Sunlight Foundation, a group that advocates for transparency in government. "When they talk about education, you have to ask: 'Have you ever seen an advertisement from American Action Network that is not political?' "
Asked for documentation that supported Aetna's claim that the money was specifically donated for educational activities, Aetna referred CNNMoney to American Action Network and the Chamber. A representative from American Action Network would only say that the group does not discuss its donors, and the Chamber of Commerce did not immediately respond to a request for comment. Sloan found Aetna's explanation unconvincing. "Everyone knows what American Action Network does. And everyone knows what the Chamber does," Sloan said. "This is all just a fiction." The issue of political contributions is not a new one for Aetna. At the company's annual shareholders meeting in May, an individual associated with the Service Employees International Union Master Trust submitted a proposal that called for the disclosure of additional information on political activity by the insurer. Bertolini said that the company's disclosures are adequate. "We agree that transparency and accountability are important," Bertolini said, adding that the company complies with all state and federal laws. "We don't believe that additional disclosures are warranted at this time."